It's 2 o'clock in the afternoon, and the grounds crew is on the field, setting up for batting practice. There is movement and some friendly ribbing, but the decibel level is low, a hum in an otherwise quiet Yankee Stadium. In a couple of hours, the Yankees will file through the dugout doors and onto the field to stretch, long toss, take their hacks in the cage. Fans will make their way into the seating bowl. Peanuts, popcorn and beer will flow. Joe Girardi comes bounding up the dugout steps, a Yankees ball bag in hand. Trailing behind him is his son, Dante. They politely maneuver their way around the grounds crew and find some space in the middle of the diamond for a time-honored tradition that has long bonded parent and child. Thr-ooo-w. Catch. Thr-ooo-w. Catch. Thr-ooo-w. Catch. Dante adjusts his glove and stance between throws, and the pair falls into a rhythm. Several repetitions in, Girardi notices an unnecessary step of the foot when Dante receives and releases the ball. He offers a correction, and the back-and-forth begins again. In the Yankees dugout, Ronald Torreyes sits easily. Game time isn't until 7. The day will prove longer than usual for the infielder. He had reported to the Stadium at around 10:30 that morning to join teammates Mark Teixeira, Dellin Betances and CC Sabathia on an excursion. The quartet read to a group of young students at a Harlem barbershop as part of the Yankees' annual HOPE Week community outreach initiative. At some point, Girardi has left the field and is now making his way toward Torreyes in the middle of the bench, jokingly asking if he can crash Torreyes' interview. He is more than welcome to, but passes, instead encouraging Torreyes to show the picture of him and his father before making his way back out of the dugout the way he came in. It isn't long into the conversation, just over three minutes in fact, before Torreyes breaks out the photograph, saved on his iPhone, that his manager was referring to: a team shot of Los Granjeros -- The Farmers -- an amateur baseball team in Torreyes' home country of Venezuela. In the back row, second from left, Alcides Torreyes stares directly into the camera, his eyes slightly squinted, his mouth a straight line across his face, his arms crossed in front of his chest. At his feet, in a team T-shirt, stands 3-year-old Ronald Torreyes: future Big Leaguer. After signing with the Cincinnati Reds in 2010 when he was 17, Ronald Torreyes made a steady climb through the Minors while shuffling among five organizations. Along the way, he rose as high as 13th on the Reds' top prospects list, as ranked by Baseball America, and in 2014, he stepped to the plate 119 consecutive times without whiffing, making him the second most difficult player in the Minors to strike out that season. Last September, he made his Major League debut with the Dodgers, hitting .333 in eight games and playing second and third base for the club. But in January, Torreyes was seemingly without a firm landing spot. Over the course of nearly a month, the 23-year-old changed hands three times, going from the Dodgers to the Yankees to the Angels and back to the Yankees, in a series of moves that consisted of him being traded once, designated for assignment three times and claimed off waivers twice. If he was rattled by the shifting nature of it all, he wasn't showing it by the time he reported to camp at George M. Steinbrenner Field. Torreyes was holding his own against Pete Kozma, who had played 275 regular season games -- plus 29 more in the postseason -- for St. Louis, and Rob Refsnyder, whom the Yankees had entrusted with a start in their win-or-go-home postseason game last October, for the backup infielder job. "One day, I was sitting in front of my locker, and as I was looking around, I saw that a lot of the people that started Spring Training with me, they weren't there anymore. So in my head, I'm like, 'What's going on? I'm still here,'" Torreyes said through Yankees interpreter Marlon Abreu. Within the following days, Torreyes received the news: Barring any trades, he could send his belongings to New York. He had made the 25-man roster. While he already had a handful of Big League games to his name, when he joined his teammates on the field prior to first pitch on April 5, it marked his first appearance on a Major League Opening Day roster. But his path to the first-base line at Yankee Stadium started nearly 20 years before he slipped on the pinstripes. Torreyes began playing ball when he was 4 years old, starting in a league for children his age called Compoticas or Semellitas -- Little Seeds -- and working his way up the different leagues as he got older. At 7, he began playing on a national team, representing Venezuela in international competition. His father, an established amateur player and trainer, could see early on not only the joy his son found in playing the game, but also the skill he had. "His glove, his hand, was really good; the way that he would hit, the way that he would think before a play would occur, those are things that you can tell at an early age -- they just happen -- and he had those," Alcides Torreyes said through an interpreter from a baseball tournament in Venezuela. The younger Torreyes played on the national team for seven years, and it was as a young teenager that he began to consider a professional career. At that time, he would watch video of All-Star infielder Omar Vizquel, admiring the energy the fellow Venezuelan channeled into every play. He wished to be like him, to get the opportunity to play in the Majors, and he committed to the effort -- with his father's help. Torreyes trained seven days a week with his dad, running the half hour from his home in Pueblo Libertad, Estado Barinas, to where they did their workouts and running back afterward. Sometimes, they ran in a river along the route, the water just above Torreyes' calves. His father would run ahead of him, smacking the water with a stick to scare off whatever animals may have called the river home and ensuring there wasn't any debris that could hurt his son. "He used to tell me that it was better that it happened to him and not me," Torreyes said. The pair did their conditioning work on the shores of, and in, Venezuela's rivers. Torreyes credits the work for the stamina he has now. When there were no more conditioning drills to be done, he and his father worked on fundamentals at Hilario Delgado stadium, where he would take 300 groundballs a day from all over the diamond and hit bucket after bucket of balls. Torreyes has four siblings, and his younger brother often would join him and his father on these training sessions, alternating with Ronald during whatever baseball activity they were doing, allowing him a respite. Ronald would take groundballs; his brother would follow with just as many. Ronald would take swings; his brother would follow. Torreyes had the talent, but he was frequently overlooked. At 5-foot-8, 150 pounds, he didn't have the build scouts were looking for, and he would ask his father why he wasn't getting the chance he felt he had earned. But the opportunity finally arrived when Alcides brought his son to the Reds' academy in Venezuela. "There were a lot of hurdles in the journey, but out of everything that we went through, hard work was the constant," said Alcides. "The more he kept working, the better he got, and eventually, I think, that's the key." Torreyes still trains with his father in the offseason, but taking into consideration the amount of work he puts in during the baseball season, they have adjusted their routine, focusing on the fundamentals and situational hitting. Torreyes will do sprints in the sand by the shore, but his days of running rivers to get to and from practice are over. "Now, we drive," he said with a smile. Torreyes had showed Girardi the photo of him, his father and the other members of Los Granjeros recently. The significance of the photo wasn't lost on Girardi; sharing the game with his son has been meaningful and also introspective, as the time he spends with Dante on the field brings to mind the good memories of attending Cubs games with his own father and hitting balls as his dad fed the machine at a local ballpark during summer breaks before the budding catcher returned to Northwestern University for another school year. Los Granjeros, Torreyes goes on to explain, is one of many amateur teams in Venezuela, where baseball reigns supreme and people eagerly await the opening of the winter ball season. (Liga Venezolana de Béisbol Profesional, which runs from October into February, is the country's equivalent of Major League Baseball.) While the teams Torreyes' father played on were not professional, Torreyes describes them as well-organized, offering a high level of competition. Growing up, Torreyes watched his dad play often. His grandmother, Alcides' mother, would take the younger Torreyes to the games, and Torreyes remembers the crowd, on their feet, calling for a home run from his father, "a pull hitter with power." When his father obliged, the fans went wild. "You could see how excited the people would get; they would start jumping and hitting the benches after my dad hit a home run, and I would be super happy because I would say, 'That's my dad; that's my dad!'" recalls Torreyes. Today, Alcides Torreyes is a trainer not only to Ronald, but also to young talent throughout Venezuela, a job he has held since he was 18 years old. In a role reversal, father now cheers on son. He hasn't been to the States to see Torreyes play yet, but when he can, he'll catch a game on TV or online, which isn't always easy. His small town, hours outside of Caracas, the country's capital, sometimes experiences blackouts. From time to time, he sees coverage in the newspaper, and in between the lines of print, Alcides sees his son's dreams beginning to come to fruition. "I see his work, the work that he's done, that it has paid off," he said. "I see that he believes in himself and believes in the talent that he has. It's amazing." Torreyes describes the experience of reporting to work at a Major League ballpark every day these three-plus months as "surreal," but also as validation of a journey he and his father started together when he was 4 years old. "I'm finally here," he said, looking out over the green of the Yankee Stadium grass. Torreyes is in touch with his father regularly throughout the season, generally every two or three days, calling after games with updates and information not easily available to the older Torreyes. Alcides responds by reinforcing the importance of building on the strong foundation they laid together. "He's always reminding me to keep working hard, to get to the ballpark early, to behave, that if I keep that up, more good things will come," said Torreyes. And as they do, his father's influence and knowledge -- the lessons learned on the riverbeds and fields of Venezuela -- will continue to guide him. Kristina M. Dodge is an executive editor of Yankees Magazine. This article appears in the July issue of Yankees Magazine. 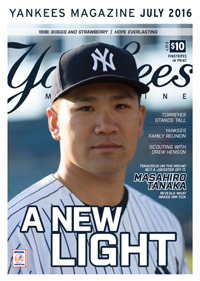 Get this article and more delivered to your doorstep by purchasing a subscription at yankees.com/publications.